The other day I referred to the Irish celebrating St. Patrick's Day and how the celebration has spread throughout the world. But someone has pointed out to me that Serbia celebrates a similar traditional feast but it is confined to Serbia itself. The Slava is a family feast. Each family has its own protective saint on whose feastday the wider family gathers and celebrates. The tradition dates back to the ninth century when Serbs gave up their pagan beliefs and accepted Christianity. 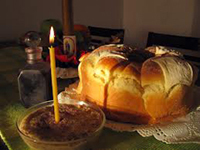 At the centre of the religious aspect of the feast is the blessing and sharing of the slavski kolac (loaf of bread representing Christ as the bread of life which is shared). When the feasting begins anyone who wishes can join the family who welcomes them with open arms and spends the day looking after their guests - invited or not.